Tim Burton’s The Nightmare Before Christmas has always been a fan favorite. Because of this, Disney has been really good about re-releasing the title, rather than keeping it in the vault half the time. 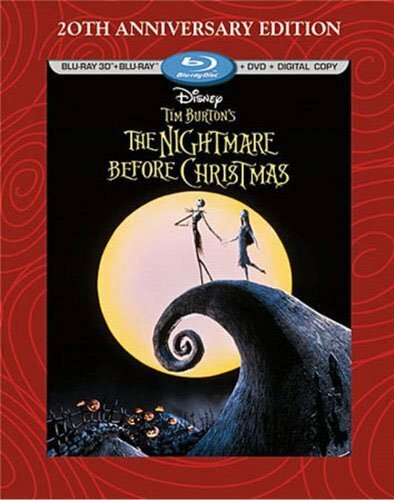 Though buyers can find other DVD and Blu-ray copies on the market, Walt Disney Home Entertainment will be releasing The Nightmare Before Christmas on to Blu-ray 3D, Blu-ray and DVD for a special 20th Anniversary Edition on September 10. Honestly, the new cover art (below) isn’t enough to scare me away from the set, but it doesn’t really pull me in and scream “buy me,” either. If you don’t own a copy of this movie—which you should—the market is already pretty well saturated with copies in various forms, so here’s a little guide to what you can purchase, right now. Besides renting a copy of the film, there are two big editions currently on the marketplace, right now. There’s a 2010 Collectors Edition with a super fun cover, which can be purchased in a Blu-ray combo pack or a DVD copy. Then, there is an edition that Walt Disney Home Entertainment put out as part of its initial foray into 3D content for TV. Like that edition, the 20th Anniversary Edition will be available in all 3 hard copy formats. The real draw, then, will be whether or not the 20th Anniversary Edition will have enough bells and whistles to entice buyers. So far, Disney has only given us the packaging and the initial announcement, but since the earlier sets all offered plenty of bonus features, this one should, as well. The real question will be whether or not the set will offer fans anything they haven’t seen before. I can’t tell you exactly what the extras will be, but I can promise some awesome tunes from Danny Elfman and some inspired animation will be included. The Nightmare Before Christmas was initially released all the way back in 1993. The film follows Jack Skellington, the Halloween mastermind and Pumpkin King, who is bored with his role. After discovering Christmas, his ambition grows and he decides to embark on a new mission oriented around the holiday, to the horror of little boys and girls everywhere. The film was praised for its use of stop motion animation and its intricate scenescapes during its time, but Tim Burton’s film has also held up over the years. In fact, Disney showed so much faith in the flick that it was the first convert to 3D back in 2006. Amusingly, the Blu-ray 3D format craze has died down since then, but if you do have the technology in your living room, you can catch the new release this fall. Or, you know, just buy it on Amazon at your leisure.